The last „Bogenfreund“ event was a truly international one. During the last MI-meeting in Germany, Lüneburger Heide, the employees of Dow Wolff Cellulosics assembled at Eggershof where they had to prove their skills in archery. For the „Bogenfreund“ it was the first time to arrange an archery event with participants from such a high number of different countries, including France, England, Italy, Netherlands, Poland, Turkey, Egypt, USA, Russia, Belgium and Germany. Therefore English was chosen as common language. After a short briefing and dividing the attendants into groups the event started with the competition between the groups. The challenge increased from round to round to find its highlight in a hunting round on 3D targets, represented by Lynx and wild boar. The hunting round prepared the archers for the following individual contest. Here, the numbers of arrows per archer were reduced from round to round. The nearest arrows to the gold centre remained in, while arrows which had hit at a greater distance were sorted out. During the final shoot-out Caroline showed impressive accuracy and subseqently became the champ of the day. The fact that she is from France might shed a whole new light on the battles at Agincourt and Crècy, suggesting that history may have had a different outcome if the French had sent their women into battle, equipped with longbows :-). Nevertheless, rather than the competition it was the experience of handling bow and arrow which provided the crucial factor of a successful evening, allowing everyone involved to get a glimpse of the spirit of the past centuries. 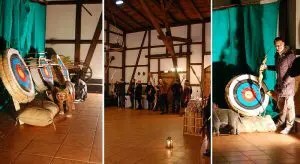 Archery in the spacious former barn was followed by an extensive and versatile Barbecue buffet at the Eggershof Café. 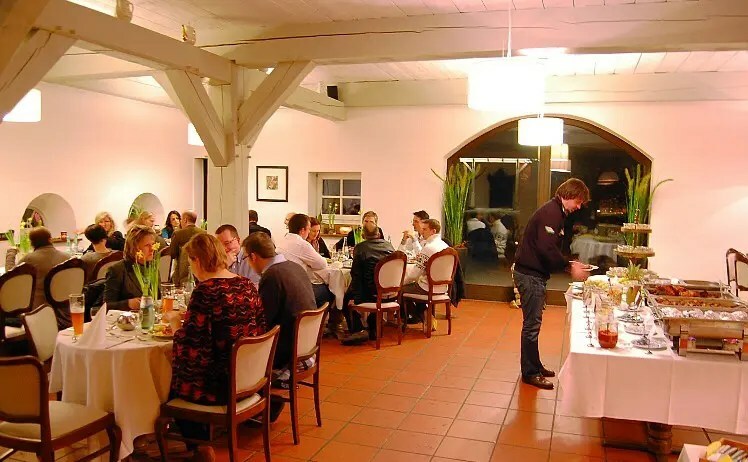 Its cosy ambience allowed for a relaxed and comfortable atmosphere and provided the adequate setting for wining, dining and conversation. Lüneburger Heide < Loved it! I love the activity so much! Thank you everyone for being there! And special thanks to Oliviero and Gregor who made this work for us. It truly was a very nice event where we were training skills we do not use every day. I had lot of fun and I believe the entire team had a fantastic evening.